We’ve been following Pitchfork for a few years now, and they’ve always been a source of new, original and interesting things. We started our collaboration with Pitchfork back in 2014, when we launched the series Director ID and produced a series of interviews for NOS Primavera Sound Porto. This video of Courtney Barnett is an example of that. Years have passed but we’ve kept a close eye on what Pitchfork has been up to, and this year, when we heard about the first edition of Midwinter, we were very eager to go. The concept is something new and exciting: the appropriation of a museum as a stage for new sounds and all sorts of music. Historical paintings met contemporary music in Chicago, during Midwinter. 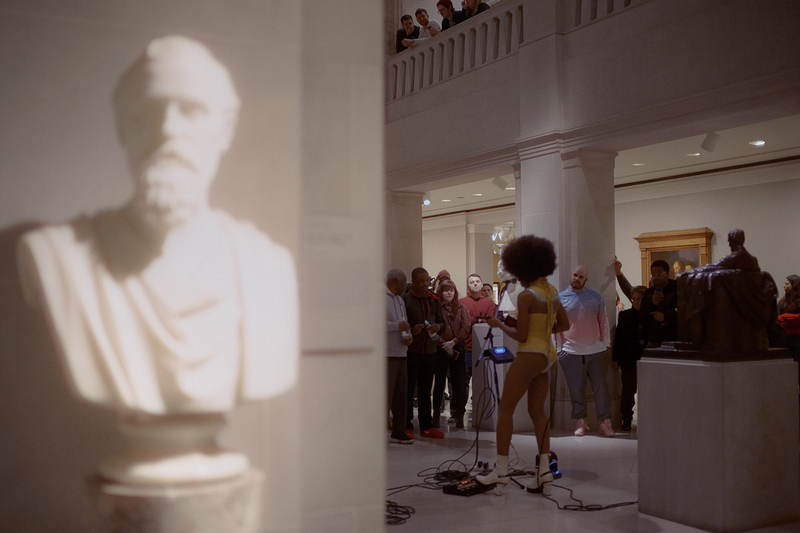 Set in the Art Institute of Chicago, the works of Vincent Van Gogh, even if only with one ear, were able to listen to the very distinct sounds from Sudan Archives to Kamasi Washington, Yves Tumor to Deerhunter, Slowdive, Tortoise or JPEGMafia, just to name a few. Paintings from Renoir, Picasso, Monet or Matisse (and this is only a small selection of the the big names in art history present at the museum) served as the backdrop to showcase both already established names, as well as new emerging artists, in the musical landscape of Chicago and the world. Pitchfork Radio was also present at the museum with an entire room dedicated to it. It was curated by Elia Einhorn, with whom we had the pleasure to chat at the festival. The result is the video below, in which Elia describes what makes Midwinter so musically rich and unique musically, and why the Chicago music scene has blossomed like it did. One interesting thing Elia points out is the fact that much like Manchester (home of the The Smiths, Buzzcocks, Joy Division), Chicago has been cursed (or blessed) with the same problem: bad weather. In Chicago, the snow forces people to stay indoors and get creative, which can be a reason why so much new music comes from there. The small scale and intimacy of the festival allow for random encounters, or “things to happen in the moment”, like Deerhunter’s Bradford Cox's improvisational set with Circuit des Yeux’s Hayley Fohr, which gave fans a unique, once-in-a-lifetime performance.